There’s been a lot of life in the almost 37 years I haven’t been dead. Once upon a time it took a week to mail off a letter and get a response. Music came on vinyl at speeds, or on cassettes; first in eight tracks, then later in 120 minutes. Home computers rocked with their 100k memory and green and black screens. Getting to the store before it closed could be a race. And if you didn’t get cash from the bank before Friday at 5pm, you were out of luck until Monday. A couple months ago I got the chance to hit up a monthly event at a surviving roller rink in the south end of San Jose, California. And wow, let me tell you it took me back. Mainly, I think, because the building, the interior, and – I think – even the skates were all original. And kept in about as good repair as you’d expect; not much. Sure took me back, though. 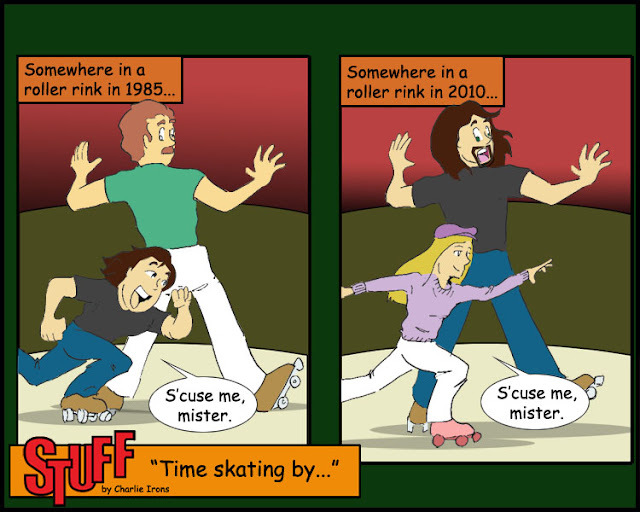 I remember being one of the pre-teen terrors on the rink, buzzing past older folk, slipping through couples, and hanging the tight turns. Twenty five years later, and my first time back in skates in all that time? I felt pretty lucky that I only fell once. Hey! That’s pretty good for twenty five years… Until I got buzzed by the eleven year olds with their own custom skates. Sure, I could have taken them in my day. But, it’s their day, now. Peace and grace be with you; I’d yell at you to get off my lawn, but I’m too busy limbering up for the next all skate!